The ubiquitous holiday list issued by the state government of Karnataka made me curious - two days of continuous holidays in January - add a Casual leave to it, and I get a 4 day holiday at home. 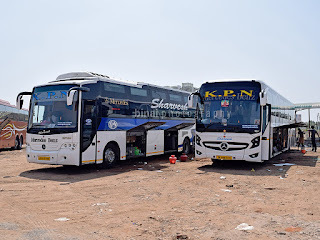 Since I was returning on a weekday, plus my recent experiences of arriving late in Bangalore in Private buses made my choice simple - I did not look beyond Karnataka SRTC. I checked tickets and was quite surprised to see lots of seats available. I hate waiting for my bus, and hence decided to book on a bus that started in Thrissur itself - so it was 2131TRCBNG for my journey. I selected a seat on the right side. My hometown was in the peak of festivities. The temple town was packed with devotees as the temple celebrated its annual ritual, called Thalappoli. I was expecting buses to be crowded due to the festival, and hence decided to head to Kodungallur in an auto and take a bus to Thrissur from there, instead of boarding from near my house. I reached Kodungallur around 1920hrs - but there were no KSRTC buses to Thrissur at the bus station. I was determined to take a KSRTC itself, and decided to wait. Its a pain traveling in a private bus with luggage - the awful seats, absolute lack of leg-space and zero space to keep luggage make me shun them as far as possible.My wait did bear fruit - around 1935hrs, RT366 of Thrissur depot arrived at the bus station. The bus backed into the bay and got set to head back to Thrissur - as the last KSRTC service to Thrissur in the day. The driver wanted to leave a minute before time, since a Private bus regularly delays its departure and runs just ahead of this bus - ending up denting the collection of this bus. As he wished, the conductor signaled him to move at 1944 (instead of 1945 as scheduled). We started off, picked up a few more passengers before exiting the bus station. 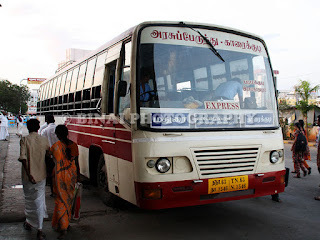 Being Thalappoli time, the bus got filled before it left town limits. The driver was in the best of moods - he maintained good pace, and I loved the growl from the Hino engine powering our bus. I was dropped outside the KSRTC bus station in Thrissur at around 2040hrs (the bus was heading for refueling - so the driver suggested getting off there to avoid getting late if there was a queue for refueling). My bus was still about an hour away - so decided to spend time looking at buses there. 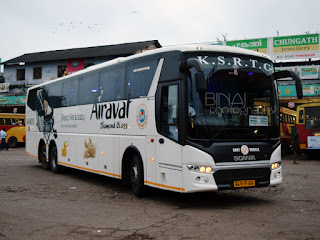 There was one special Airavat to Bangalore leaving about 15 minutes before my bus - it was rattling heavily and making all kinds of scary noises. The bus seemed to be full. My bus was brought in at 2115hrs - they directly parked the bus at a platform. Earlier they used to park a little away, and bring the bus to the platform only at departure time. My bus was full as well. Getting into the bus was a bit messy, since it was parked in a tight spot, but our people decided to mob the bus even though they had reservations! I decided to wait outside - went to the conductor after the crowd lightened. As usual, he asked me to read out the last 4 digits of the PNR and show my identity proof. m-Tickets are an absolute blessing - no paper wasted and no tension of having to carry print outs. The AC was already running and it was chilling inside the bus - I love buses this way - "pre-cool" them before boarding. Boarding was over quite fast. By 2130hrs, we were ready to leave. The conductor got two unreserved tickets as well. The conductor got his waybill signed off, and we backed out at 2136hrs - 5 minutes late. As we were leaving, I saw the Ernakulam-Bangalore Mercedes still boarding - that bus was supposed to have left a good 20 minutes before us! The driver was not in a hurry - but kept pace. This fellow was the typical "BCD-4" crew - shifts to top gear quickly and lets the engine struggle to pick speed. I tried hard to doze off, and did succeed in short bursts. We reached Palakkad at around 2259hrs. The driver did not enter the bus station, but stopped on the road, near the exit. A KaSRTC guy at the bus station called up passengers booked in this bus - we were off at 2301hrs! I slept off for sometime after Palakkad. Do not remember much after this. I woke up briefly as we were at Sankari Toll - it was around 0130~0200hrs then. I slept off again. I woke up as the conductor walked through the bus to the back, and the bus got off the highway to a service road - we stopped below a flyover and two people got off (the unreserved guys who got in at Thrissur) - the time was 0412. From the looks of the place, I thought it was Hosur - and I was overjoyed! But the joy was shortlived as we passed a toll-gate shortly after the flyover - that was Krishnagiri! Sometime afterwards, the bus pulled into one of the dreaded places on the route - Hotel Surya, at Kurubarapalli (0422hrs). I had some expletives in my mouth - why does the driver want to waste time when the destination was hardly an hour away! Hardly anyone got down from the bus - and even those who got down went to the loo directly. We started off again at 0430hrs. My eyes were quite heavy - so I fell asleep again. I slept quite well, and got up only as we stopped at Attibele toll - 0521hrs. I woke up now, and pulled up my backrest. We stopped somewhere before Electronic City (guess it was Chandapura). There was nobody to get off at Electronic city on this trip. I moved to the cabin soon after we passed Chandapura, and informed the crew that I need to get off at Bommanahalli. The conductor asked if I had luggage in the hold - I replied negative. I was dropped off at Bommanahalli at 0543hrs. I love getting off at Bommanahalli than Silk Board - because no auto goons attack you, nor do you have to pay exhorbitant rates if you call an Auto. I walked off to the Auto stand, and took a rick home - he charged double the normal rate (I am okay with that) - and did not charge extra even though my destination was a bit away from the landmark I had quoted. He was genuinely worried when he did not have enough change to return - I thanked him from the bottom of my heart - such drivers are really really rare! Great going dude! 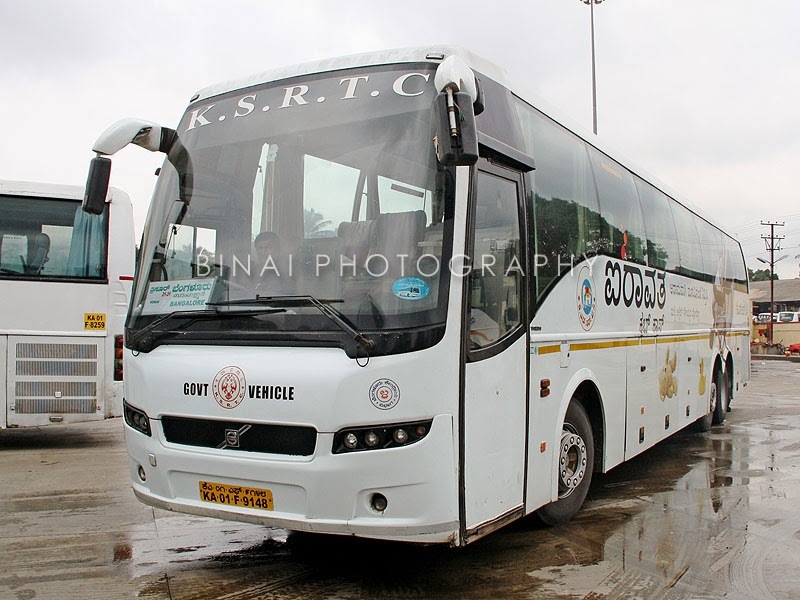 To conclude: The bus, KA-01-F-9148, of Bangalore Central Depot-4, had about 5.66 lakh kms on the odo. This bus used to run to Ernakulam earlier, now moved to Thrissur. Maintenance was average - a lot of sounds came from the rear suspension. There were no rattles, but the bus did make strange noises while running. No movies were played - one very good feature that I love in this service. The break in the morning could've been avoided - if the crew wanted refreshment, they could've stopped at a Toll gate instead - it saves a lot of time. Driving was superb as usual (except the lugging part) - absolutely no honking, and sleep friendly driving. Being pongal time, traffic in TN was really low - that helped us reach on time for sure. KaSRTC certainly needs to revise the speed limit in these premium services - they need to value the passengers' time for sure. Overall, it was a pleasant journey. The end-to-end run took about 8h07m. Entertainment: Available, but not used. Will I take this service again? Most Certainly YES! Its already one of my most preferred services.